Spider Fangs! Mechanism C&C please? Figured I'd share what I've done so far and see if anyone has done any similar mechanisms in the past (not necessarily for a spider) or else has any suggestions for me, before I start spending money. I expect the puppeteer's hand will need to go inside the head or else behind the head. But it could also be operated via brake cables, etc. 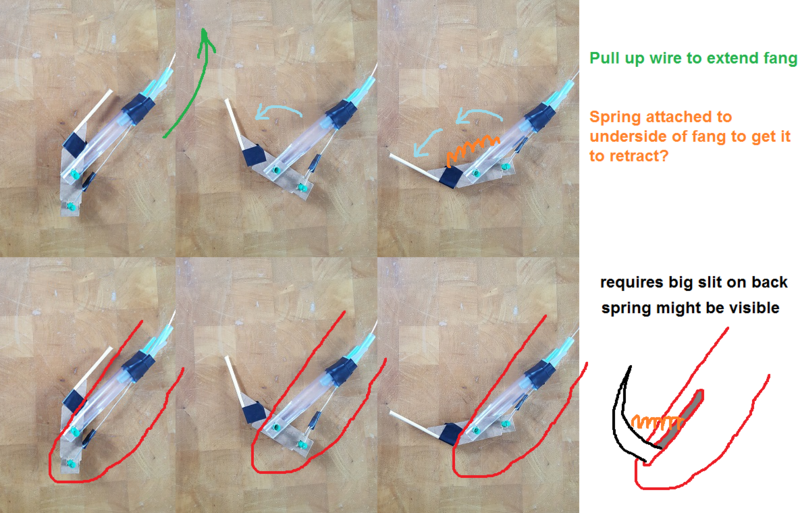 Here's a pic of my second iteration of the fang extension mechanism. I just cobbled it together with some cardboard, tubing, pens etc. It's a start, but it isn't great. I'm sure a better, simpler design approach is out there somewhere. 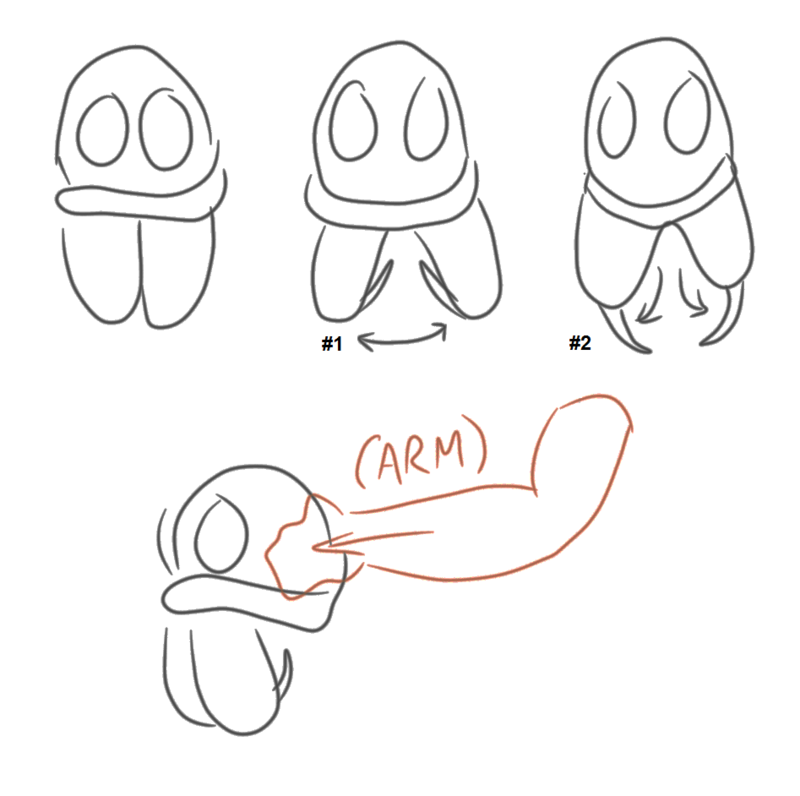 Like, for example, the swivel of the fangs could occur without a big, visible spring attached to the back of the fang itself--and there's gotta be a way to do this where there's only a small hole in the chelicera, where the base of the fang attaches, rather than a huge slit that unnaturally accommodates half of the fang. I thought about breaking down the pole to try and orient the pincers at a perpendicular angle to the handle. 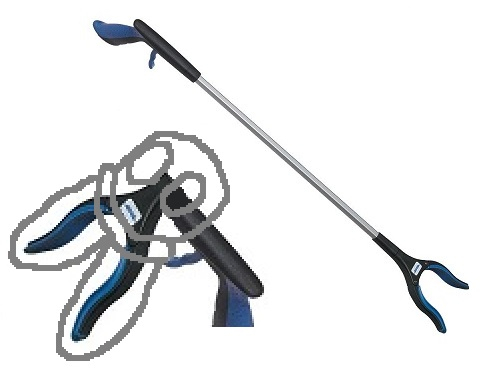 It'd require a new style of mechanism to link the pincers to the trigger--the existing wire wouldn't work. Before I go breaking anything, figured I'd see if anyone could recommend another approach. I'm super excited to share progress on this fella. If anyone has any suggestions, I'd love to to hear from you! Your mech for the fangs looks pretty good. You might be able to get it to work without having a spring visible by using a rod (rather than cable) and having the spring inside the head on the rod. Or using a more rigid cable that can push as well as pull. For the chelicera movement, the device you found is a good reference for how to achieve that result. I would try making your parts based on it rather than using the existing product if you can get away with it. Might be cheaper or a better fit for your design, unless the off the shelf product ends up being the right size/budget. This sounds like a cool project, I hope you can share more with us as you build it!